It's been another week of dealing with the scripting sides of things for Better The Demon. When this happens, I don't have much "exciting" to report, although I can say I have probably done just as much work as any other week. It's coding 'behind the scenes', which does not translate to being able to show any interesting new screenshots. One of the biggest script changes I made to the module this week was another revision of how I handle the PCs a player adds to their party, either by the party creation system or by adding companions. I won't bore you with the details, but I am hoping the revised scripts make the handling of party created PCs more accessible to the code, which means I can have easier access to them with respect to them giving comments during the game, subject to their personality. Item usefulness is another of the prime aims for this campaign. Hopefully, this will have come across to readers who are following the blog. Stores will not be inundated with dozens of items way beyond the PC's means, nor be of many variations of similar things, but will be more specific and useful to all PCs in their adventure. Putting it simply, I hope to make the player more interested in buying items from a store than as a place for selling them. I have also been expanding the 2da encounter tables for the overland map. Like editing spell scripts, it is a slow and laborious task, and one that I hope will reap the benefits for future modules once it has been completed. After all, once all the templates have been completed, it is then a lot easier simply to edit a single 2da file to take advantage of the new scripts. Although I have shown similar screenshots to this next one, I thought I would show you another with one of the new creatures encountered (a dire badger). It's an excuse for a screen shot anyway. 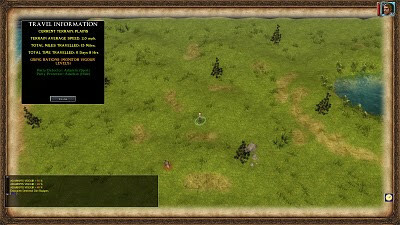 ;) It also demonstrates some differences to what one would normally expect when on an overland map: the travel information system (new GUI); the vigour system (in the main window), the edited overland map frame (no rest or party button), the CR encounter colour for the creatures (main window) and the new Date GUI button (opens a larger GUI) on the bottom right of the screen. I am once again at the stage where I hope to begin writing another quest. I have already considered doing more towards the main quest now, and in theory, writing should get a little easier from here on in, which could even mean signs of slightly accelerated progress! I have covered most of the systems I wanted to incorporate, and even though at least three of these (spells, crafting tome and overland map) still require a great deal of work, they are things I can chip away at between plot writing. PLOT PREFERENCES: Do Not Forget To Vote! We are into the last couple of weeks for the current poll. If you have not yet voted, then I am still after your vote (and feedback?) on your gaming preferences as requested in this post.